Recycling used tires not only keeps them out of trash dumps but it also can make some really neat things for you or for other people. If you are going to take it to a tire recycling company, make sure that they are reputable and will put the tires back into production once they have been recycled. If you want to make something with your tires at home, there are a number of things you can do with them. If you have smaller tires you can cut them up and make them into flower pots. You will need a saw that can cut through steel, this will take a while, but the effect in the end comes out really nicely. If you get good at it, there is also a market for these sorts of items, and you may be able to get paid for it. You will want to cut the tire into strips and bend them back into a circle. Secure the tire to itself with solid wires. You can make them any size you want. You will then want to cut out circles from the remaining parts of the tire to put in the bottom. If you cut these out right, they should sit inside without you needing to secure them down, but if you want to be safe you should secure the bottom to the rest of the flower pot. You can make these in all kinds of sizes from small enough to fit in your hand, to using large truck tires as outdoor planters to raise plants above flooding levels. Other people get very creative with how they make these tire planters. If you want something a little more playful to make from your antique tires , try making a tire swing. It is an icon of youth and is a lot of fun for kids. There are two main types of tire swings. 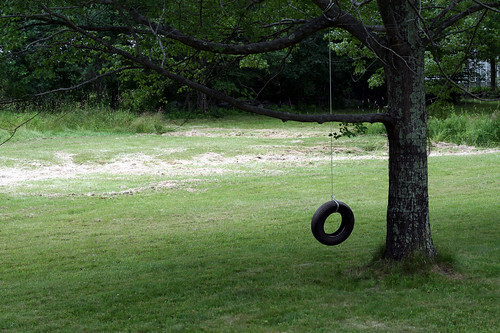 If you want a simple tire swing you can just tie a rope around the tire and around the tree and you have a tire swing . These are best if they are made from larger tires so that you can sit inside the hole, but with a smaller tire, the kid can sit on top of the tire. A variation on this way of making a tire swing is to tie several ropes to the tire around the edges and keep them at even lengths. Tie all of these ropes to the tree, keeping the tire in a horizontal position. This will give the kid or adult a place to sit on the swing. This can be fun to make from a tire of any size.